Ski area named Tre Valli "three valleys" are separate parts which are interconnected by a common Specials: Val di Fassa, Valle del San Pellegrino and Valle de Bois. The area has around 100 km of pistes of varying difficulty, well-maintained 90% of them with guaranteed snow. Luxury resort Clubresidence Adler Family & Wellness has an excellent location just a few steps from the center of Moena and directly across from the convention center Navalge. Luxury resort Aparthotel Adler Family & Wellness has an excellent location just a few steps from the center of Moena and directly across from the convention center Navalge. Hotel Fanes is centrally located in the Val di Fassa, also part of the Tre Valli, about 400m from the center of Moena. Family run friendly hotel Someda is located above the town of Moena, about 800m from the center, bars, restaurants and shops. Hotel Cristallo has a quiet and sunny location, near the town center and the Passo San Pellegrino is situated at an altitude of 1918 meters above sea level. Newly built Villa Alessandra is located in Falcade, part Molino near the slopes, with beautiful views of the mountains and valley. Shops about 200m, center of Falcade 1.5 km. Molino Apartments Ciasa are conveniently located opposite the ski lift in Falcade. Shops about 200m, center Falcade 1.5 km. Avisio Park Hotel is located in the center Soraga di Fassa (1242 meters) and has a panoramic view. Central part of the resort town's largest Tre Valli's San Pellegrino, which lies on the highest point of the eponymous mountain pass at an altitude of 1,918, where the cable car leading on both sides of the valley. The highest point Tre Valli ski area is 2.513 m Col Margherita. From the top you can ski down to 1.190 m Falcade the magnificent red pistes, elevation 1.320 m, length 14 km guarantee great experience. 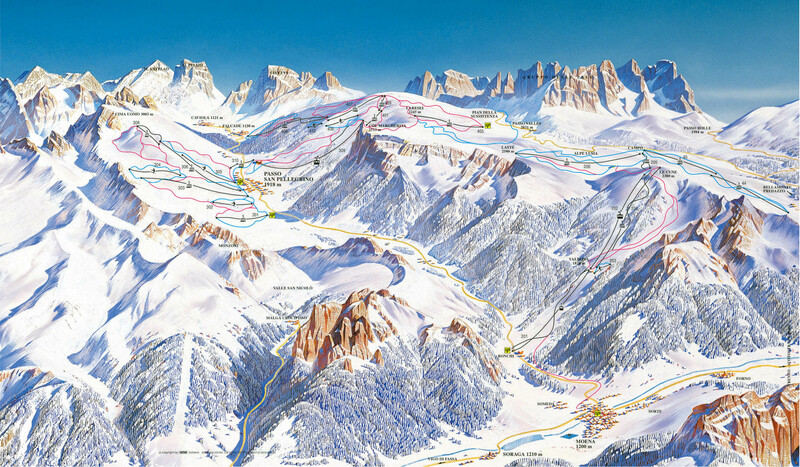 Another part of the Tre Valli ski area is a ski resort Alpe Lusia - Moena, which is situated between the Val di Fassa. Ski track of red, blue and black and one is located on the slopes of the highlights of 2500 mA Last Le Cune 2.380th Boarding places to ski lifts are Moena, Bellamonte (Predazzo), Campo.